Now for the lowbrow... this one is just too funny. 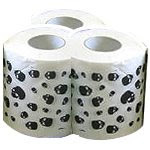 Now you can wipe your delicate hiney with Gothic distaste with this skull patterned toilet paper. A great conversation piece for your bathroom, (that is, if you hold conversations in the bathroom, either with others or yourself). If you are a VERY thorough entertainer at Halloween, Dia de los Muertos, or similarly morbid soiree, this would contribute nicely to the decor.